Verm-X is a 100% natural wormer which is available in both a liquid and pellet formula. The Pellets are 2mm in diameter and mix well into regular manufactured feeds or home made feeds. The liquid can be mixed with water or soaked into bread and fed directly. All ingredients are natural and non-GM and the pellets are produced in one of the UK's only low temperature pelleting facilities to avoid damaging the ingredients during production. The Health Kit contains one pack of 250g Verm-X Pellets and one Westgate Labs faecal egg count test kit: everything needed for a chicken owner to safely send a sample to Westgate Laboratories for independent testing with no extra fees. Allium sativum (garlic), ulmus fulva (slippery elm), mentha piperita (peppermint), thymus vulgaris (common thyme), galium aparine (cleavers), cinnamomum zeylanicum (cinnamon), picrasma excelsa (quassia), foeniculum vulgare (fennel), urtica dioica (nettle), capsicum minimum (cayenne). Sunflower oil, seaweed meal, allium sativum (garlic), mentha piperita (peppermint), thymus vulgaris (common thyme), ulmus fulva (slippery elm), galium Aparine (cleavers), cinnamomum zeylanicum (cinnamon), picrasma excelsa (quassia), foeniculum vulgare (fennel), urtica dioica (nettle), capsicum minimum (cayenne). Repeat the following guidelines for 3 consecutive days of each and every month. 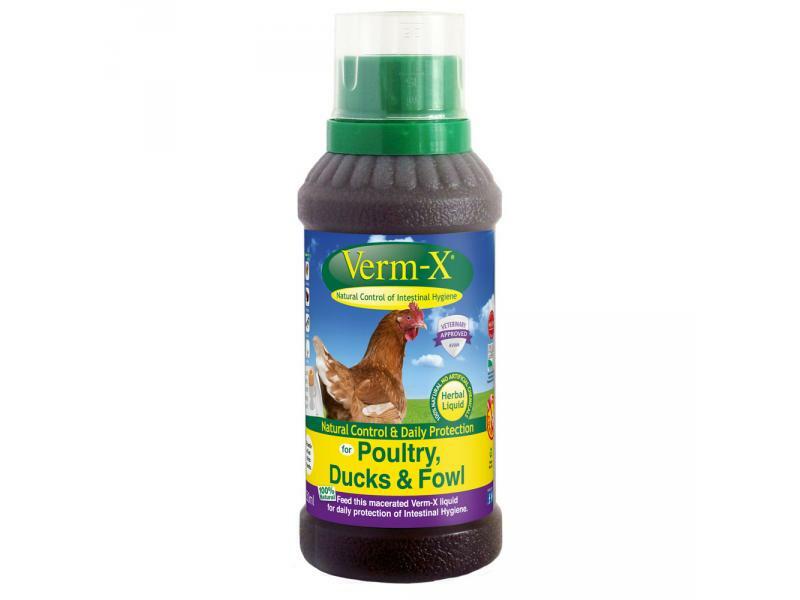 Below are some recent questions we've received regarding Verm-X Poultry, Duck & Fowl Wormer, including answers from our team. Has Verm X got a very strong smell ? 1 review comments on a very strong smell and difficult to remove. Is this because of poor storage or passed its use by date or has it a naturally strong smell that some poultry or ducks might need to get used to Thank youby more dilute introduction first? This product contains several strongly aromatic plant substances (including garlic) and although I have not used it myself, I can imagine it smelling like a sort of strong curry paste. This is probably necessary for it to have any effect and will not be down to storage. Birds do not seem to be put off by these sort of smells and indeed they might even like them, it is difficult to say. What is the shelf life for this product and the dosage? Our current stock has a two year expiry and one bottle should last five months for a flock of ten birds (based on the treatment of chickens). For chickens and ducks, 1.5ml per bird and for turkeys and geese, 3ml per bird. The correct liquid dose should be added to the sole source of daily drinking water or can alternatively be given soaked onto bread. The product should be used for three consecutive days and repeated once every month. It is perfectly safe to use a double dose upon introduction or when necessary. The product comes with a measuring cup for ease of use.